The Internet of Things (IoT) industry seems to have past the hype as concerns around the security of devices connected through IoT start emerging day by day. 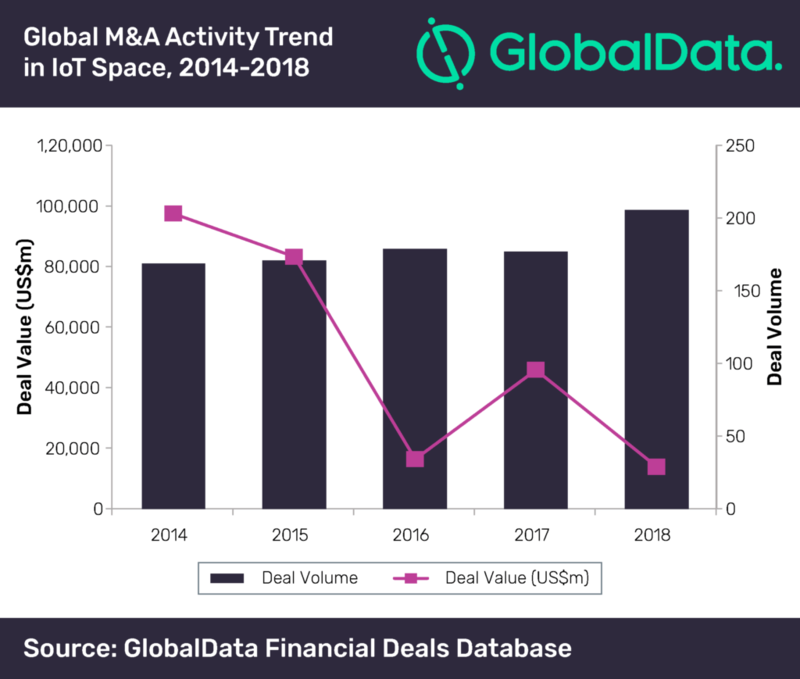 This reflects in the analysis of GlobalData, a leading data and analytics company, which reveals that venture capital (VC) funding and mergers and acquisitions (M&A) activity in the IoT marketplace witnessed fluctuating fortunes during 2014-2018. After registering growth in 2015 and 2016, VC funding in IoT space declined in 2017 in terms of value. However, in 2018, the deal value again registered a 8.3% growth, despite drop in volume. Overall, VC deal value increased at a compound annual growth rate (CAGR) of 10.4%. However, deal volume declined at a CAGR of 9.9% during 2014-2018, suggesting growing average deal size. Of the top five VC funded companies during the review period, the US and Chinese companies accounted for two positions each. While the US-based Magic Leap and Carbon3D collectively raised US$2.8bn, the two Chinese firms Xiaomi and Horizon Robotics accounted for a total disclosed funding value of US$1.8bn. Spotify, a Swedish company, also made it to the top five list with a total disclosed funding value of US$526m. As per a study by Cisco in 2017, the success rate for companies implementing IoT is as low as 26%, primarily due to serious concerns over cyber security. In October 2016, a huge distributed denial of service (DDoS) attack by Mirai botnet malware using insecure IoT devices made Internet inaccessible in the US for some time. On the other hand, M&A volume increased at a CAGR of 5.1% during the review period, with growth witnessing across all the years, except 2017. Meanwhile, M&A deal value declined at a CAGR of 38.6% during the period. In 2014 and 2015, high M&A deal value was mainly due to big-ticket acquisitions such as the US$37bn acquisition of Broadcom Corporation by Avago Technologies, Intel’s acquisition of Altera Corporation for US$16.7bn and Google’s US$3.2bn acquisition of Nest Labs. With more than 50% share of deal volume and around 75% share in the total disclosed deal value, the US accounted for the major share in M&A deals during 2014-2018 followed by the UK, France and China. Seeq Corporation, a manufacturing and IIoT advanced analytics software company, secured US$23m in Series B funding in July 2018. Earlier in April 2018, Konux GmbH, a German provider of IIoT that integrates smart sensor systems and artificial intelligence to maximize asset performance secured US$20m in Series B funding.